Up here in our mountains, we have two different at-home vehicle cleaning services. They travel to you, and they clean your vehicle in your driveway. You might be raising your eye brows... but we need them because we live on a dirt road. 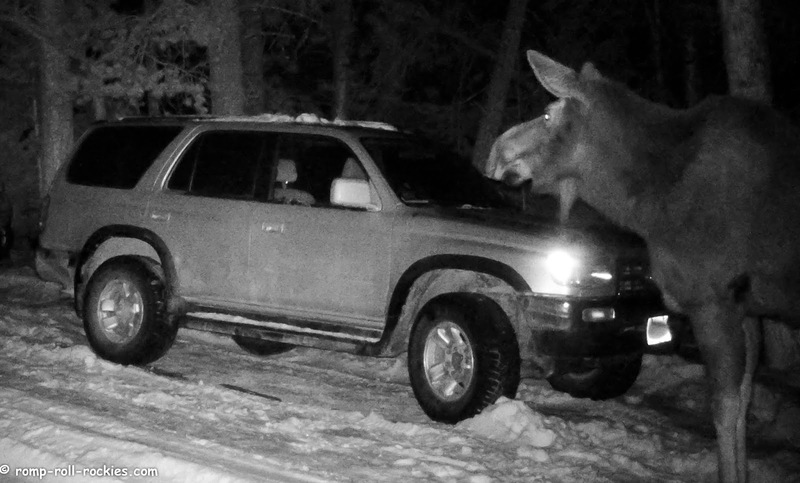 One of them ("Moose Mobile Vehicle Cleaners") cleaned our 4Runners the other night. Unfortunately, they didn't do a great job. They left the windows and body streaked. It almost looked like finger painting on the dirt of the vehicles. And the side-view mirrors were impossible to use due to terrible streaking. 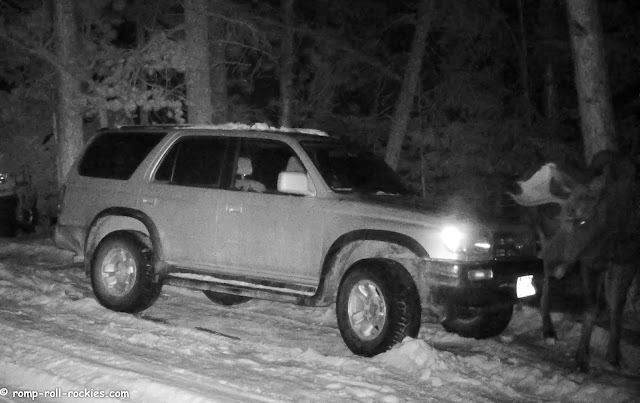 Fortunately, I had a trail cam near the vehicles so we could see who the workers were. This one was a youngish looking female. In this photo, you can see her male accomplice in the back of the vehicle. They definitely work fast. It appeared that they'd gone over two entire vehicles in about 3 minutes. Three minutes! No wonder they did such a lousy job! If you'd like to see a video of them at work, here it is! They do not look very enthusiastic about their jobs - And I hope you didn't give them a tip!! :-)!! PS: You said my post yesterday made you cry, your comment about Chip meant a lot and made me cry too. Thank-you for your support and cheering Chip on. It means a lot! I know he will never be a "normal" dog, 10 years is a long time to live as he did, but you and Shyla are examples that I'm following and give me hope. Right now, I'm just trying to get him past being afraid of the clicker...baby steps...Thank-you again. Good guess - we think it's the minerals (including salt) on the vehicles that attract them. Bahahahaha!!! I thought it was a legitimate thing!! Too funny! He's so slow and methodical, I really think he's trying to do a good job. That is so funny to see. We also were thinking that they were licking the road salt off the car. KB that is hilarious...way better than a bear but wonder what in the world taste so good. They put brine/salt on our highways and streets which I guess would be tasty to Moose but I doubt they put that on a dirt road. That is pretty funny! I wonder why they like to lick the cars. What great captures of your car cleaning service. I so love the wild. You just never know what will show up and entertain you. We think it's the minerals (including salt) on the vehicles that attract them. You had me going for a minute there with your first couple paragraphs! Wow, seeing them next to your vehicle like that really shows just how tall they are!! Well, at least they didn't do the interior! LOL - We really enjoyed your humor today:) The man of the house here is our chief car washer. He does a fantastic job with one exception - he fails miserably at window cleaning:) Talk about streaks!!! The supervisor did very well to stand and watch. Free service, guess you get what you pay for!!! When you travel on a dirt road, with car, truck, ute or quad bike, cleaning would be a daily job, and I am not amazed that so many do a "car Clean" just every so often. Salt off the road somewhere maybe, you need to make it tastier, sprinkle some real food around next time. Must be a homeless mouse. Did they approach you with a squeegee and did you have to slip them a fiver? That is such a cool and weird thing to capture. I assume they use salt on your roads? MOL and BOL we think it's a good thing they were in such a rush they skipped the interior detailing. Fun to see them, but darn to them licking the road chemicals from your wheel area. I just had to have my breaks done for the second time in a year due to road chemicals. They must be using stronger stuff these days. Can not be good to eat. 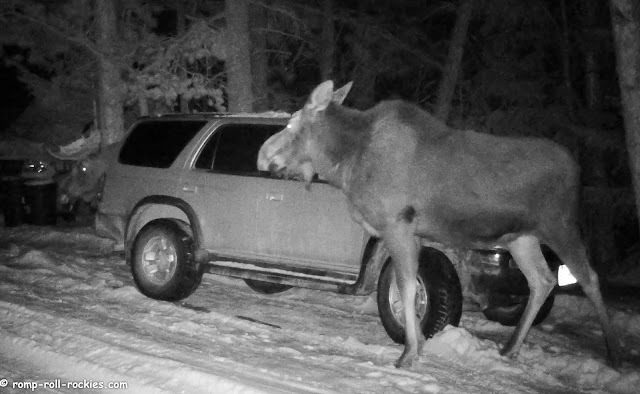 Love how large moose are! Ha ha, we have to laugh at Pocket & River Songs comment! BOL!! Glad they are at least using organic saliva to clean the windows!